Some organizations have a marketing strategy that integrates content marketing into other channels such as PR or advertising. Make sure your outside content marketing team understands and shares the goals of your larger marketing strategy. On the other hand, smaller businesses may be looking for help building a content marketing strategy. If this is the case, you will need to budget time and money to have your agency develop the plan. You may be surprised with the questions they ask about: everything from Google Analytics to typical users to your sales process. Fill them in on any work you’ve already done and give them the rope to develop a plan for you. And don’t rush the process, creating content without a strategy can be a big waste of time. Content marketing is definitely an ongoing and long-term strategy, so you need to give outside writers, designers or agencies a chance to develop and test content ideas and strategies. Improving search results, growing mailing lists and increasing your influence rarely happens overnight. 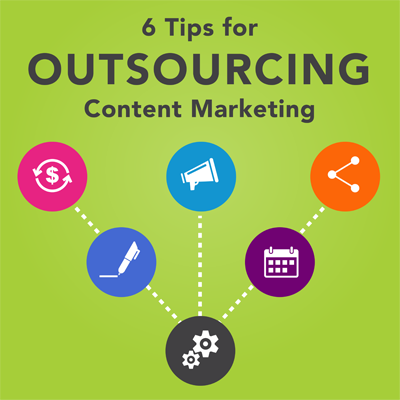 For companies who are new to paying for this type of outsourced content marketing help, it can feel like a big risk to hire an agency for a 6 or 12 month engagement, but it’s not realistic to go much shorter. This type of work is usually done on retainer—meaning you pay a set fee every month. With this longer time frame you and your team can begin to test and try out different strategies and content types. When you work with a content marketing agency, you’ll probably have a team of writers and designers (and maybe other specialists like videographers or SEO experts) working on your account. Remember that different people and different agencies may not work using the same process that your team followed internally. For example, writers have different development styles—they may prefer to start with an outline, a rough draft or the first thing they present to you may be fairly polished. Before signing a contract, ask about how ideas will be generated, presented, researched and refined. Get an idea of how you will see work in progress. Many firms have brand identity guidelines: details about how to use the logo, corporate fonts and colors. However, it’s also a good idea to document and give examples of how you use your corporate voice. Developing and maintaining the right voice for your brand is often the secret sauce that makes good content marketing so much more appealing. If it feels authentic, then readers, customers and prospects connect with your brand more easily. There is some trial and error with content marketing, so why reinvent the wheel if you’ve already tried an approach or topic. If it failed, see what your agency can do to make it better. Sometimes a small adjustment to the tone or presentation makes a huge difference. Also, an increase in promotional work outside of the content development may lead to improved results. There is usually someone who is looking for some hard numbers for the ROI of content marketing. Yet, content marketing tactics can be hard to track and measure their effect. Content marketing can be slow to built momentum, which can be frustrating when you’re looking at early metrics. However, the results tend to snowball over time so give yourself enough time to develop and promote content.